Lafayette, LA – Come this October Bayou Teche Brewing will be doing something they have never done before, brewing a craft beer that will be available for a special release in conjunction with a festival. The special event in question is the Bayou Vermilion Festival & Boat Parade taking place on Sunday, October 20 from 10 a.m. – 4 p.m. at Vermilionville. The specialty ale being brewed for the festival is called Floatilla and all beer sales will go towards the Bayou Vermilion District’s mission to beautify conserve and manage sites along the Vermilion. Bayou Teche Brewing began well before it brewed its first beer. During the six years owner Karlos Knott was stationed in Germany and traveling abroad with his family he noticed that each town had a brewery with a unique style. The beer seemed to revolve around the food, not all that different from Arnaudville, Louisiana where he grew up. When he returned to the states after the army he started brewing and tweaking batches of beer that he thought would complement the food. In 2012, after 10 years of creating brews and countless long nights drinking Knott and his family decided to become legitimate and get a license to sell their home brews. Knot said initially they were just hoping to sell a little bit, but soon the calls started coming in. They quickly outgrew their one barrel brewery and built a newer one in his home town of Arnaudville that can produce up to 500 gallons of beer a day. LA31’s product line currently boasts a regular line up of 11 original brews – five year round (Bière Pâle, Boucanée, Bière Noire, Passionné and Acadie) and five seasonal (Courir de Mardi Gras, Saison D’Ecrevisses, Cocodrie, Bière Joi and Miel Sauvage) rounded out by a Belgium style stout for the winter season. Their newest creation Floatilla is the first beer they’ve crafted that will be available for a special release at the Bayou Vermilion Festival and Boat Parade on Sunday, October 20. “We’ve brewed a small batch splitting the beer between kegs that we will be serving at the Festival and bottles with the Festival’s artwork that people can take home.” Whatever bottled beer is not sold at the parade will be available for purchase at Vermilionville’s gift shop La Boutique and its restaurant La Cuisine de Maman while supplies last. Floatilla is a bière de garde that offers the style’s prominent malty aroma with an underlying caramel sweetness that finishes off medium dry. The new brew is very malt forward with four different kinds: Canadian pilsner as the base along with a couple different French malts and a German Munich malt for the backbone. The malts will then brew in French hops before it goes through its final process of ageing on a white ash wood for a month to give it a smooth finish. 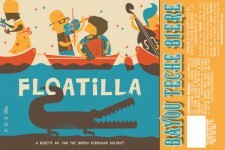 “Once its completed Floatilla will have a light color and body, but the pairing of the variety of malts we used with the white ash wood will make it a smooth, easy to drink beer, perfect for a Fall festival,” says Gar Hatcher, one of Bayou Teche Brewing’s beer crafters who came up with the concept for Floatilla. 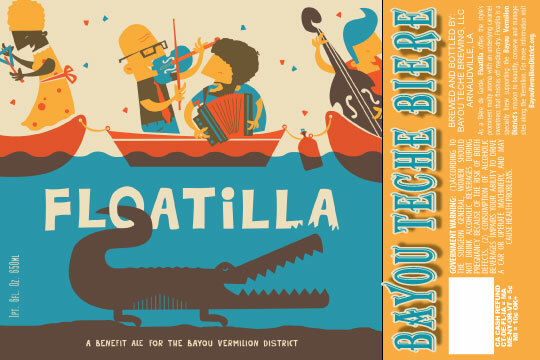 The relationship between the Bayou Vermilion District and Bayou Teche Brewing began well before the collaboration of the Floatilla Ale. When the new brewery was built one of the problems they faced was what to do with the 3 to 5 gallons of waste water produced for every gallon of beer. Knott says they had the option to process the waste water through septic systems, but he didn’t feel it was making an asset out of a problem. With the thought of zero discharge and with the help of the LSU Ag Center, Knott devised a system of ponds that would take the waste water and return it to its original state. What was once the family’s old bean farm is now two ponds to process the waste water. The first pond allows the solids to settle out and then is pumped over to the second where the water sits until its levels are safe. In order for the water to be filtered the brewery needed plants to surround their artificial wetland. Knott approached the Bayou Vermilion District and utilized their free native plants and trees that are provided as part of a series of demonstration projects for the community on how to improve water quality. “The native plants were the last piece to the puzzle for the pond filtration system. Now we have an attractive solution to an otherwise wasteful problem,” said Knott. Those looking to get a taste of the Floatilla Ale will have their chance at the Bayou Vermilion Festival & Boat Parade on Sunday, October 20 at Vermilionville. The Festival will kick off with a viewing of antique putt-putt boats and engines as well as a discussion with the boat owners from around the South. The day continues with a preview of the upcoming film by Charles Richard, “In the Mind of the Maker,” followed by a panel discussion on Louisiana Boat Building Techniques: Past to Present. There will also be a screening of, “The Pirogue Maker,” in its rare color format with musician Scott Ainslie providing the live soundtrack. Following the film will be the unveiling of one of the pirogues created for Robert Flaherty’s, “Louisiana Story,” that is currently on loan to Vermilionville. There will also be a kid’s corner with crafts and demos throughout the day, guided tours of Bayou Vermilion District’s rain garden and native plants, canoeing, Bayou Vermilion boat tours, cooking demos and tunes by the Plate Lunch Playboys and a performance by Chubby Carrier & the Bayou Swamp Band from 1 – 4 p.m. Admission to the Festival will be $5 for adults, $3 for students and seniors, children 6 & under enter free. The Bayou Vermilion Boat Parade will kick off around 3 p.m. with a celebratory toast by this year’s Grand Marshall Ray Brassieur. The parade will depart from Vermilionville and end at the Camellia Bridge Launch with a celebration complete with live music by the BonSoir Catin trio, as well as food and drinks. The public is invited to participate in the parade by registering their boat or paddle craft at BayouVermilionDistrict.org. Bayou Vermilion District will also be taking reservations on a first come first serve basis for those wishing to use their canoes, single or double person kayaks for the parade. To reserve your water craft from BVD visit BayouVermilionDistrict.org. For more information about the Festival or to register for the parade visit BayouVermilionDistrict.org or call (337) 233-4077. See below for a timeline of events.